A PEDESTRIAN mown down by an out-of-control double decker has told how he got up and walked into a pub. 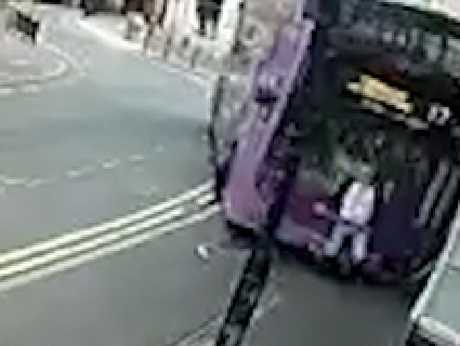 The Sun reports The No 17 bus careered on to the pavement and ran into Simon Smith from behind. He was dragged along, hitting his head on the windscreen and shattering it. Then he was thrown 45ft - saving him from being crushed under the wheels. But instead of waiting for help, Simon picked himself up and ducked into the Purple Turtle boozer in Reading, a town in southern England. CCTV of the drama has been viewed millions of times. Married Simon told The Sun: "I came down the street, it was early morning, I'd gone to pay in a wage cheque at my bank. "I make that journey every Saturday. I didn't think anything of it. "But then I heard some banging behind me and I was hit from behind. "Then you can see what happened from the CCTV. The video says it all." He added: "I didn't tense because I didn't know it was coming. After it I just wanted to get somewhere safe. "It's quite funny everybody think I have gone for a pint. "I was actually looking for a place of refuge when I went into the doorway of the pub." But he did get to have a beer after getting discharged from hospital following checks. Police did not believe his tale - until they saw the CCTV. They are now investigating. "I hadn't lost consciousness so I knew what had happened. "But the police and paramedics didn't believe me. "Originally they were all in agreement because if I had been hit by the bus, I wouldn't be here. 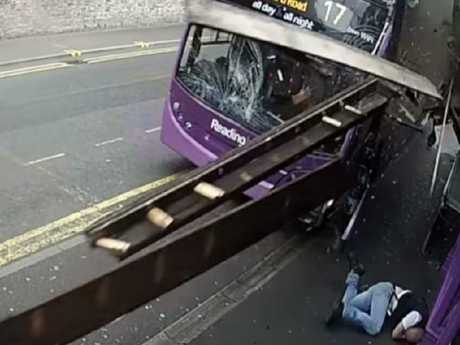 "I said 'I'm sure the bus hit me' and they kept saying 'No you were hit by debris'. "An officer then saw the CCTV at the pub and came back and said 'I'm really sorry you were right'. HGV driver Simon, of Earley, near Reading, Berks, said: "I feel very lucky to be alive. "On another day I would have been with my wife and my five-year-old walking with them. 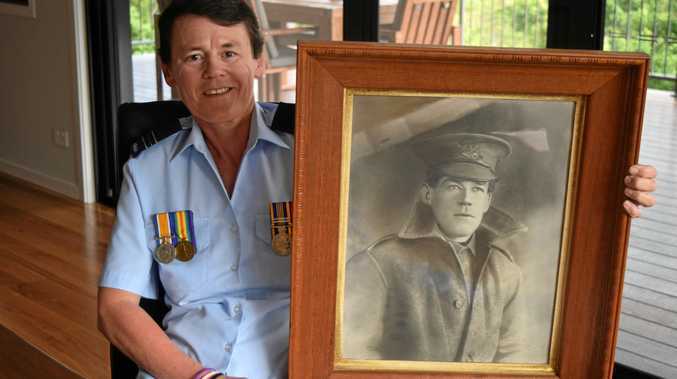 "I'm feeling quite traumatised that I should be dead and that could have been them." Simon escaped with cuts and bruises after the shocking collision in Reading town centre last Saturday at 9am outside The Purple Turtle where he used to work. He added bravely: "Time will tell but I dont' think I've broken any bones." "It's mostly extensive bruising and gravel rash. "I'm very thankful to be here, because really I shouldn't be here." Daniel Fraifeld, 50, who co-owns the Purple Turtle, said: "I think Simon pretty much got up, brushed himself down and then an ambulance came and took him to be checked. "He got looked over and didn't have any lasting injuries - but he's covered in scrapes and bruises. "He then got released from the hospital and I think he just went for a pint to relax." Cops and the bus firm are trying to work out what caused it to crash leaving the road showered in glass. It is also believed to have crashed into a bin before hitting a building and then the wall of St Mary's Minister. A second person was also injured by debris and taken to Royal Berkshire Hospital for further treatment. A spokesman from South Central Ambulance Service said: "We were called at 9.12am reporting a bus having hit a lamp post at the above location, and then taken down a shop canopy." 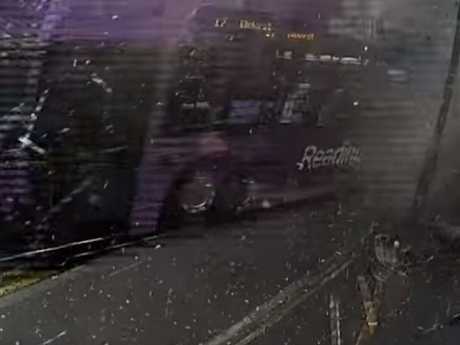 Reading Buses said: "The incident is the subject of an ongoing internal investigation as well as an investigation by the police with whom we are working and sharing footage from our on-board CCTV.